The hustle and bustle of the holiday season are in full swing. While some of us may be roasting chestnuts on an open fire, others are feeling overwhelmed by the chaos. Winter is the perfect reading season, so why not avoid the mall mayhem and indulge in some light reading? 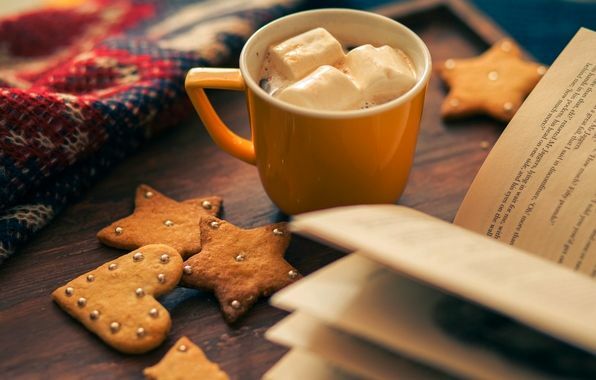 Here are seven holiday reads sure to leave you feeling festive! When has A Christmas Carol not made a holiday reading list? Arguably, it’s the most classic Christmas tale that has remained a seasonal staple for generations. Dickens crafted a timeless ghost story that reminds us of the often overlooked joys of the holiday season. One of the most iconic characters in literature, Ebenezer Scrooge symbolizes the redemptive qualities of human nature, reminding us all that it is never too late to make positive changes for a brighter future. As the year comes to an end, this is the perfect novel to encourage reflection on this past year and establish resolutions for the upcoming one. A classic story based on Truman Capote’s childhood, “A Christmas Memory” is a nostalgic account of the author’s last Christmas spent with his older cousin. This novel is full of classic feel-good activity, like baking fruitcakes and flying kits, and inspires readers to hold on to some tethers of tradition. A heartfelt, coming-of-age story, Capote’s short story reminds us to reminaboutce on the people and practices that make our holidays truly special. The “Journey of the Magi” is a poem from the first-person recollection of a Magus, one of the Persian Magi, who came to visit the Christ child as recorded in the second chapter of Matthew. Beyond the biblical nature of the poem, Eliot explores universal themes of uncertainty and fear that can accompany times of transition. The next time you pass a Nativity scene this holiday season, whether you’re Christian or otherwise, take note of the three wise men bearing gifts and muse on these universal human feelings highlighted in Eliot’s poem. Fed up with the materialistic conventions of Christmas, a married couple decides to save money and abandon their yearly traditions. Their community is not amused by the couple’s efforts to boycott the holiday and purposely try to make the couple regret their decision. While Christmas may be intended to be a unifying occasion, its original purpose is often clouded by the commercialization of society. Grisham’s humorous novel is a reminder of what really matters during the holidays. Hint: it’s not buying stuff. KWANZAA AND ME is a series of dialogues based on meetings with the author and teachers, as well as parents, exploring the idea of African-American children being placed in all-black schools to provide more cultural support. Paley’s work encourages readers to have conversations about institutional racism, the education system, and the importance of celebrating heritage. Kwanzaa is a time to honor the virtues that strengthen community, therefore this is a fantastic read to not only shine a light on current issues present in our country but to also gain some perspective this holiday season. During the White House’s Sixty-Third Annual Pageant of Peace in December 2005, Angelou read “Amazing Peace” before President George W. Bush lit the national Christmas tree. Influenced by the rhetoric, rhythm, and imagery of Southern black preachers and gospel choirs, Angelou acknowledges that humanity has still not found peace, despite the countless progressive efforts made throughout history. Regardless of what you choose to celebrate this holiday season, Angelou’s poem is a reminder that we should all practice peace. “A New Year’s Eve Adventure” is a story-within-a-story, merging reality with fantasy. Essentially, it’s about a man who falls in love with a beautiful woman, sells his soul to the devil, and is doomed to wander eternally in search of his lost self. While this may be far from your ideal New Year’s Eve adventure, this story is an entertaining, romantic fantasy sure to inspire a good look into the mirror. Do you want to learn more about these authors and their other literary works? Check out eNotes.com to find detailed biographies of your favorite authors alongside full summaries and study guides!